Bucolic landscapes give way to mysterious narratives, myths, and rituals in these latest grand and intimate paintings by Verne Dawson. A bound Prometheus, an alluring mermaid, and a crucified Jesus are instantly recognizable. Other subjects arouse only a fleeting memory. 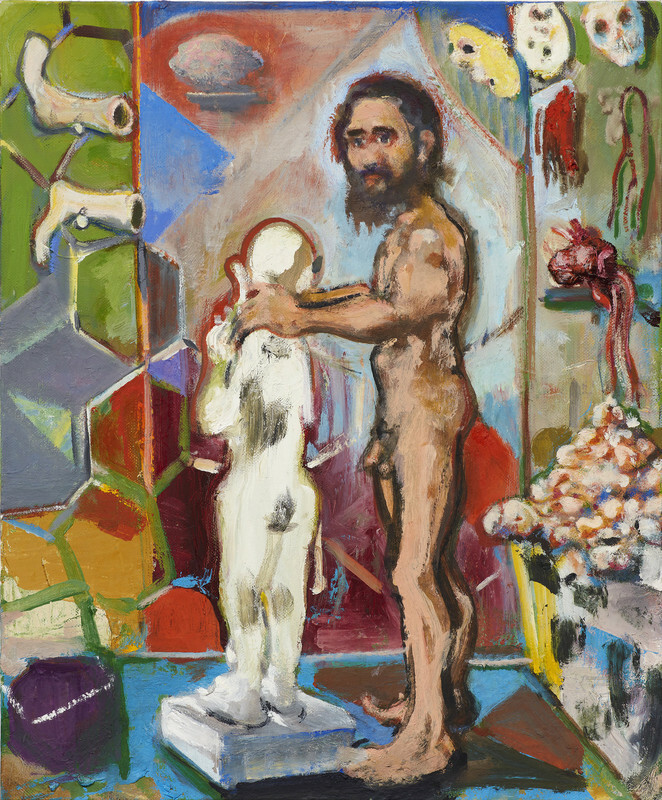 In the show-stopping The Theft of Fire (2019), a couple steals fire from a prehistoric era while others go about their ceremonial solemnities, holding unidentifiable objects among modern architecture in the same expansive setting. Time and space are a continuum as the pleased skeleton in the foreground holds court over the contemplative characters. Dawson paints the rhythm of the natural world swiftly and fluidly, laying thick marks over thin gestures in a no-fuss manner. Rough-hewn lines and smudges create the narrative, magically conveying the turn of a foot or the terror of a duck with seemingly little effort. A concurrent exhibition of Dawson's work is at Galerie Eva Presenhuber, with an emphasis on numerology and astronomy, and an elegy to a most likely extinct bird.